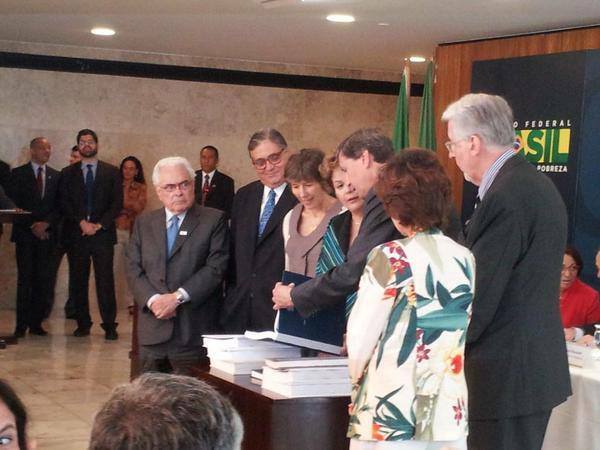 Truth commissioners giving the report to Brazilian President Dilma Rousseff this morning. Photo Credit: National Truth Commission website. December 10, 2014, Washington D.C.: Almost thirty years after the end of Brazil’s military dictatorship, the Comissao Nacional da Verdade [National Truth Commission] today released its long awaited report on human rights violations by the security forces between 1964 and 1985. The report, which took two-and-a-half years to complete and totals over 1000 pages, represents the first formal attempt by Brazil as a nation to record its repressive past and provide a detailed accounting of the system of repression, the victims of human rights violations, as well as the identities of those who committed those crimes. In contrast to the U.S. Senate report on torture released yesterday in Washington which redacted even the pseudonyms of CIA personnel who engaged in torture, the Brazilian report identified over 375 perpetrators of atrocities by name. In its recommendations, the Commission took the bold step of calling for a repeal of Brazil’s 1979 amnesty law which has, to date, shielded military officers from human rights prosecutions. Those prosecutions could be aided by evidence from declassified U.S. documentation. In support of the Commission’s work, the Obama administration agreed to a special declassification project on Brazil, identifying, centralizing and reviewing hundreds of still secret CIA, Defense and State Department records from the 1960s, 1970s and 1980s. Last June, Vice President Biden personally delivered 42 documents into President Dilma Rousseff’s hands; more recently the U.S. Embassy passed another tranche of over 100 records, many of them from the CIA, to the Brazilian government. As part of a commitment Biden made to open U.S. archives, the administration is continuing to review hundreds of additional records to declassify and provide to the Brazilian government next year. This intelligence cable, sent by the U.S. Consul General in Rio de Janeiro, provides detailed reporting on a “sophisticated and elaborate psychophysical” method of torture being employed by the Brazilian military against suspected militants. In response to growing international condemnation of human rights violations, the cable suggests, the Brazilian torturers have adopted more modern interrogation methods that leave less visible evidence of abuses. In cases where detainees are “eliminated,” the military is also deceiving the press by claiming they were killed in a “shoot-out” while trying to escape. The cable was declassified on June 5, 2014, only eleven days before Biden’s trip to Brazil in order for him to provide it to President Rousseff as a diplomatic gesture. But key sections of the document are redacted, presumably at the request of the CIA, that identify the military units responsible for these atrocities — information that would be of critical use to the Brazilian Truth Commission as it attempts to hold the military accountable for the atrocities of the past. The Consul General in Sao Paulo, Frederic Chapin, reports on a source described as “a professional informer and interrogator working for the military intelligence center in Osasco,” an industrial suburb of Sao Paulo. The source has provided graphic details on methods of abuse, including a Brazilian form of “waterboarding” that involved putting prisoners in vats of water that forced them to stand on their tiptoes for prolonged periods of time to be able to breath. The informant also provides a description of methods of executing prisoners so that their bodies could not be identified. Prisoners would be machine gunned from head to toe — a method referred to as “sewing” the suspect up. U.S. Ambassador William Rountree advises the State Department that openly protesting human rights “excesses” by the Brazilian military government will be counterproductive and “damage our general relations.” Ambassador Rountree encourages the State Department to oppose a piece of human rights legislation known as the “Tunney Amendment” which would link U.S. aid to Brazil to a U.S. government certification that the Brazilian regime was not engaged in human rights violations. Ambassador Rountree submits an 11-page report on death squad activity in Brazil. He advises that there has been an “upsurge” of victims of unofficial operations in recent months, believed to be the work of off-duty policemen. In Sao Paulo, the death squads are reportedly led by Sergio Fleury, who has now been charged in at least one murder. Some of the victims are common prisoners, others political figures and militant opponents of the regime. Much of the information in the report is gleaned from newspaper articles; the report appears to contain almost no intelligence information. 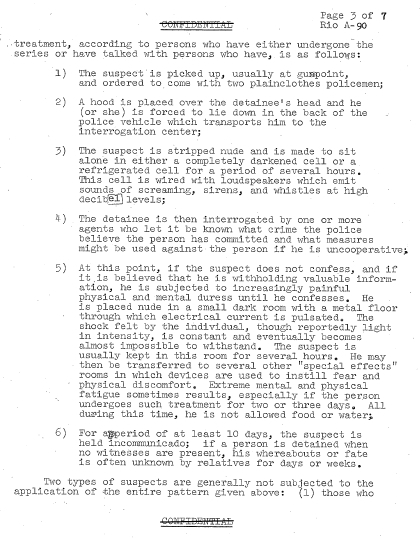 This memorandum of conversation contains a report by a U.S. businessman, Robert Horth, who was detained by the military police in an apparent case of mistaken identity. Horth relates hearing from fellow Brazilian prisoners about torture at the prison where he is held in downtown Sao Paulo. The torture techniques include the Parrot Perch — known in Portuguese as “pau de arara” — and electrical shock to all parts of the body, as well as the “telephone technique” where an interrogator stands behind the seated prisoner and smacks both sides of his/her head repeatedly, almost destroying their eardrums.